I have come across this particular ingredient when I was looking at what the French call “cocotte” recipes. The Tonquin bean was an ingredient used in a dessert made with pears and apples. As usual, when I don’t know an ingredient or I know it is something I cannot find locally, I try to look up replacements. 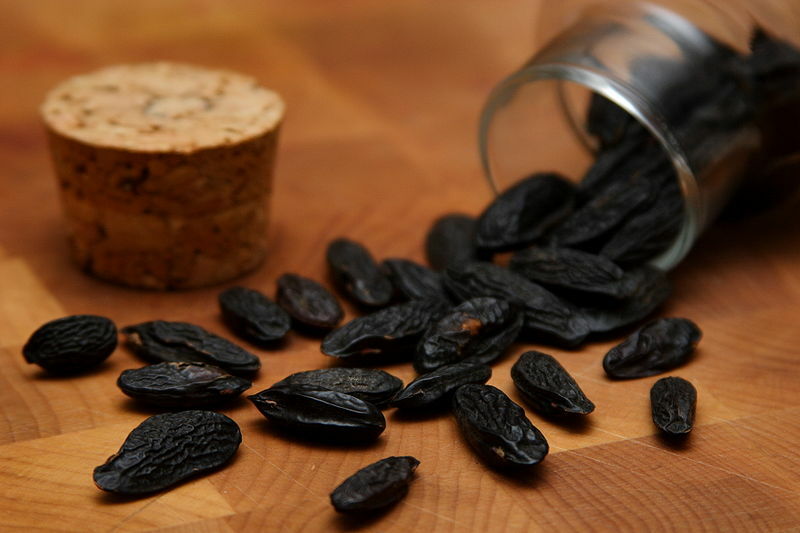 Synonyms: Tonka Bean. Coumarouna odorata. Habitat: A forest tree native to Brazil and British Guiana and called there ‘Rumara’. Description: The odor of coumarin, which distinguishes the Tonka Bean, is found in many plants, especially in Melilotus, sweet vernal grass, and related grasses. One pound of the beans has yielded 108 grains of coumarin, which is the anhydride of coumaric acid. In addition to its use in perfumery as a fixative, coumarin is used to flavor castor-oil and to disguise the odor of iodoform. The fatty substance of the beans is sold in Holland as Tonquin butter. Medicinal Action and Uses: Aromatic, cardiac, tonic, narcotic. The fluid extract has been used with advantage in whooping cough, but it paralyses the heart if used in large doses. “Originated from South America, the Tonquin bean has the taste of sweet almonds or hay. The main producers today, are Venezuela and Nigeria. According to French Wikipedia, if used in small doses Tonquin bean has beneficial effects: it is a medicinal plant that can be used as a mild anticoagulant. If used in big amounts the effect is harmful for health. It has also been used to aromatize tobacco, although the Encyclopedia mentions that this use and in food is forbidden now in France and USA. There is an article in English on Wikipedia for those who want to read it. Basically for a safer option, Tonquin Bean can be replaced with vanilla or almonds (crushed maybe) and why not both.